I am a terrible mother! Just a few days ago, I realised that I still had one of my son's Christmas presents hidden away! Not even wrapped!! And it was the one thing that he had wanted 'so very badly', a lava lamp. I hot-footed it upstairs, wrapped it in some reindeer paper and duly handed it over. The lamp was pronounced "awesome" and has been switched on ever since.... until today. I broke it, right in front of him; it was only four days old. I knocked it over while closing the curtain, and that was the end of the lamp. Now, a husband can be bought off with a caramel vacherin or a chocolate raspberry tart, but not a 14 year old. 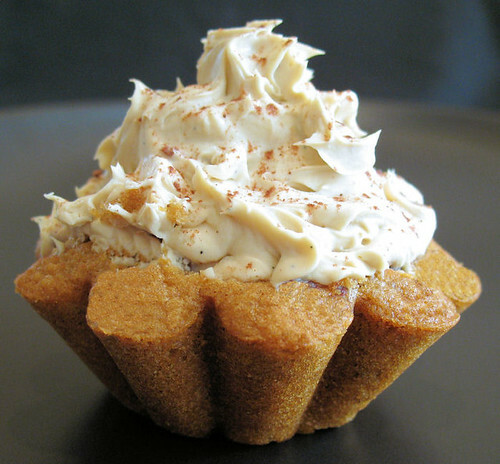 Not even cappuccino muffins can soften the blow, and they are usually 'awesome' too. As if to prove I really do have the 'brain of a goldfish', I'd forgotten to put the chocolate chips into the muffin mixture. And surely a goldfish wouldn't make 'mini' muffins - that's got to be the 'worst idea in the entire world'. So even though I can't do anything about the lava lamp today, I can remake the muffins, complete with chocolate chips and in muffin tins that take more than one bite. These muffins are really good warm, and although you could use ordinary cream cheese for the topping, I've used creamy mascarpone, which adds another dimension. And don't forget the chocolate chips!! Preheat the oven onto 375º F / 180ºC. Melt the butter in a small saucepan and leave to cool. In a large mixing bowl, combine flour and sugar. Crack the egg into a medium sized bowl and add the milk and coffee granules and stir until the coffee is dissolved. Pour this coffee mixture onto the flour/sugar and add the melted butter. Stir until just combined. Fold in the chocolate chips. Fill the muffin cases with the mixture, do not over-fill, you want the cases to be about 2/3 full. Bake for 15-20 minutes, until springy to the touch. Cool in the tin for about 5 minutes before putting the muffins onto a wire rack to cool. In a medium bowl, mix the mascarpone cheese, vanilla sugar and coffee powder together in a bowl until blended. I just use a spoon to mix. Add chocolate chips and spread onto muffins. Ooooooh! you must have felt so bad! I hope you find another lava lamp soon. By the way, terrific recipe, I'm adding it to my deli.cio.us to try shortly. I can never get enough muffins especially chocolate and coffee ones! In my house it wasn't considered Christmas unless my mum forgot one of our presents only to find it in the cupboard weeks later! Those muffins are absolutely gorgeous! And I think forgetfulness is one of the "perks" of being a mom! That's why I make lists, lots of them! Those look spectacular! As for lava lamps, it was the only thing that could help me fall asleep in my freshmen dorm! 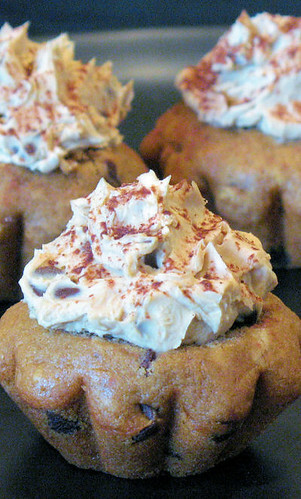 I would love to eat one of these right now...the frosting sounds especially good! FAb looking muffins. Sorry about the lava lamp though. I have one you can borrow. It's a huge sparkle lava lamp. Nic, you poor thing, Im sure your son will get over it. The muffins look great yumm. Those are some of the prettiest cupcakes I have ever seen. I love the flavors in these especially the use of mascarpone cheese. I look forward to making this recipe, thank you. Magic Cochin - I really did feel bad, but I bought a new lamp today and it's a much nicer one! I actually used to hate coffee, but I love it now, there's hope for you yet! Margot - he took it quite well really! Hope you like them as much as we do. Laura - chocolate and coffee is a winning combination for me. I am so glad I'm not the only forgetful one!! LyB - thanks so much, and I am a big list maker too - even have lists of lists, lol! Mansi Desai - he was ok about it really, and he's going to kill me if he claps eyes on my post!! Tulip - I'd love to make them for you and I'll try not to harm any more lava lamps in the process! Brilynn - your comment made me laugh out loud, thanks! Susan - thanks so much and I'll have to get him to put the new one in his bedroom - he is a night owl and has trouble going to sleep! JEP - thank you for visiting, and for the lovely comments! Marie - thanks for the kind offer, that's so sweet of you, but I have replaced it now. Patricia - that's nice of you to say that but my kids wouldn't agree, ha ha! Chris - so glad you came to visit my blog! He's over it for sure. Julie - oh thank you! I am using mascarpone quite a lot these days, I really like it too. The muffins look and sound great. I'll have to give them a go. Oh poor you re-lava lamp!! Your muffins sound really delish and the taste of one of these hopefully will put a smile on your sons face!! Oh. My. God. I'll swap you my piece of carrot cake for one of those muffins! Awww! I'm sure the muffins helped some.. They look delicious! Rosie - yep I can be so clumsy sometimes! aforkfulofspaghetti - now that, I would like! clumsycook - thank you so much! Those muffins look wonderful and a great photograph too. Poor son - poor lava lamp! Wow - what beautiful muffins - I'm not even that keen on coffe but these look so gorgeous that I am definately tempted to give them a try. I love the story about the lava lamp - I can sympathise! My dad bought a lava lamp for my brother as a joke Xmas present because it was the most out-of-fashion thing he could think of. He had no idea they had come back round again since the 1970s. That's old people for you. Thanks Margaret for the lovely comments! Antonia - you could make them all chocolate instead of coffee! Trig - that's funny! Most of the old fashioned things seem to be making a comeback these days! Man, too bad about the lava lamp. Though it looks like everything turned out okay in the end. Your muffins are beautiful. I love the molds you used and the whimsical frosting decoration. gorgeous muffins. will definitely try these. Have to confess that the ones without chips appeal to me more, but I'm not a teenage boy. I love the non-traditional shape you use, but the killer is that mascarpone topping. It seems like a tiramisu you can pick up with your fingers! Bri - thanks, I used brioche tins for the muffins. Maybahay - thank you , hope you like them as much we do! ThreeTastes - that mascarpone topping is 'the business'!! You could use it in a variety of ways, eg for cake filling. Oh you poor thing - how mortified you must have felt. Love the brioche-shaped muffins - and they sound as if they taste as good as they look!